← Brexit & workers’ rights. Meh. A new Acas research paper – Managing conflict in the contemporary British workplace, published this week – includes some interesting, if not entirely surprising, findings on the impact of the hefty employment tribunal (ET) claimant fees introduced in July 2013. “a majority view that tribunal fees were a blunt instrument which could have the effect of deterring meritorious as well as weaker claims”. Furthermore, the employment lawyers “agreed that the introduction of fees had changed the nature of cases that they were being asked to take”. Lower value claims are now much less common, as there is “little benefit” in workers pursuing such claims, given “the obligation to pay fees [as well as] the fear of retaliatory action, particularly for those with less than two years’ service”. Well, blow me down with an ET1 form. The HMCTS quarterly tribunal statistics confirm that relatively low-value ET claims for deductions of wages (aka ‘wage theft’) have “virtually disappeared”, but there is also evidence that fees have significantly changed the nature of higher value claims for unfair dismissal and discrimination. 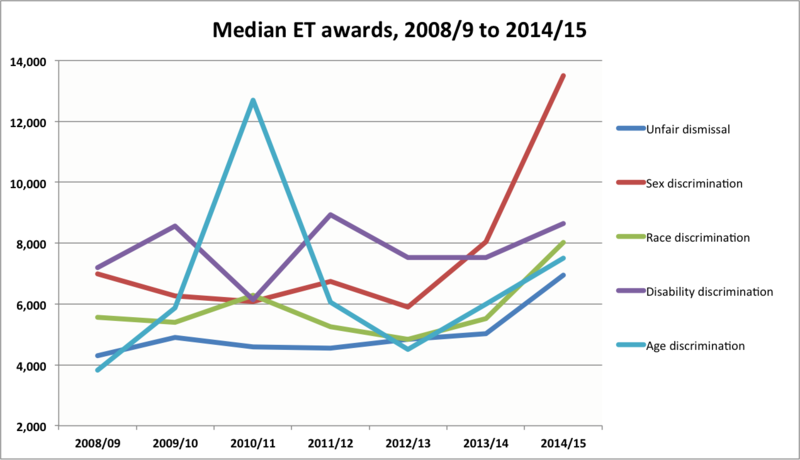 Just look at this chart, showing the median value (£) of ET awards for unfair dismissal and the principal discrimination jurisdictions. I am an increasingly grey and wrinkled policy wonk, so I know we shouldn’t make too much of any change in just one time period. But I would be willing to bet a reasonable amount of my rather small salary on this chart showing the beginning of a sharply upward trend in the level of the median ET award for unfair dismissal or discrimination (the only jurisdictions for which the lackadaisical HMCTS bothers to record the relevant data). For the simple reason that, by eliminating lower value unfair dismissal and discrimination claims, the ET fees of up to £1,200 have forced the median value of such claims upwards. But – duh, I almost forgot – there is no reason to worry. There is Acas early conciliation. Everything is hunky-dory. Though I do wish those Acas stats were a bit more transparent. This entry was posted in Justice and tagged Access to justice, Employment tribunals, ET awards, ET fees. Bookmark the permalink. 1 Response to ET cases: going down. ET awards: going up.